Echo's marquee microscope, Revolve, easily transforms between upright and inverted configurations to offer two microscopes in one. Photo by Jason San Agustin. SAN DIEGO--(BUSINESS WIRE)--Echo, the company who created the first-ever hybrid microscope, announced today the completion of $7.5 million in Series A funding. The capital investment, co-led by Dolby Family Ventures and Tech Coast Angels (TCA), will support Echo in scaling manufacturing, strengthening the company’s sales infrastructure, and developing future technologies. Echo, formerly Echo Laboratories, is setting a new precedent in microscope usability and design. 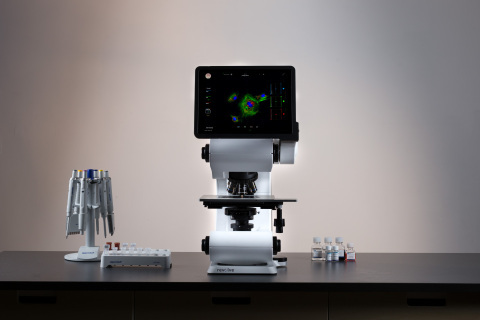 The company’s hybrid microscope, Revolve, combines the functionality of both upright and inverted microscopes to significantly reduce costs, while freeing up valuable laboratory space. Revolve also leverages tablet and cloud-based technologies to capture and manage image data while delivering a modern, seamless approach to data management and hardware integration. The global microscopy market is expected to reach over $6 billion by 2021 (MarketsandMarkets Research), yet new technology has been slow to evolve. The Revolve’s capitalization of this opportunity through its usability and versatility has been early adopted in top institutions such as Stanford University; University of California, San Francisco; Harvard University; Yale University; 23andME; Pfizer; and the National Institutes of Health. Echo’s future products will include a higher end model with automation, designed for those in biotech and pharma, as well as an entry-level model for students, educators and those focused on science, technology, engineering, and mathematics (STEM). Echo previously raised $5 million from angel investors, including TCA. Echo won TCA San Diego’s Quick Pitch contest in 2016, beating 146 competitors for the $15,000 first-place prize. Echo was founded in 2013 and is headquartered in San Diego. Echo is changing the way you view science through the first-of-its-kind hybrid microscope. Its marquee microscope, Revolve, easily transforms between upright and inverted configurations to offer two microscopes in one that reduce costs and free up valuable laboratory space. Echo, formerly Echo Laboratories, was founded in 2013 and is headquartered in San Diego. To learn more, visit www.discover-echo.com. Echo announced today the completion of $7.5 million in Series A funding. Investment will support scaling manufacturing, strengthening the company’s sales infrastructure, and developing future tech.